Let's face it, gang. AOR, Classic Rock, Glam Rock, Hair Metal and melodic Hard Rock used to sell like crazy. No matter what you thought of them then, these genres ruled the world and were certainly embraced by red-blooded American teens and young adults looking for a way to escape from their boring lives. Countries like Japan slobbered this stuff. Every major label had a few hit bands on their roster that fit nicely into one (or more) of these categories. Thankfully, the scene didn't die: it just went underground. Now, two decades on, the scene is thriving again and while it hasn't had a breakout act scale the charts yet, it's coming! There's even the Steel Panther, who parodied the music so well, it has brought attention back to what people thought was a dying breed. Labels like Frontiers Records (based in Italy) has kept the fire burning for years and there are more labels springing up all over the world, serving healthy helpings of fist-in-the-air Rock anthems to a new generation of kids looking for a release. This ongoing movement is bringing the old fans back as well. Norwegian rockers Wig Wam haven't forgotten what that scene was all about and, on Non Stop Rock 'n' Roll , they bring the fun back into music! While they are certainly a 'modern' Hard Rock band, the lift liberally from the Glam Rock blueprint, combining pre-Top 40 Poison with the klassic sound Of Kiss, adding a bit of Queen into the mix. 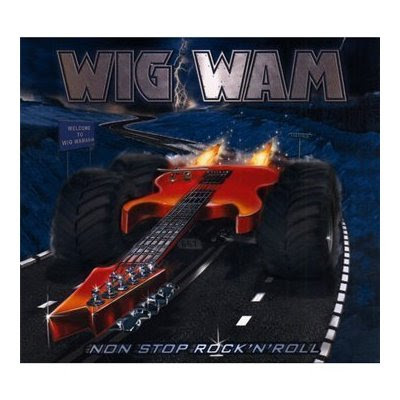 Some may automatically compare them to Steel Panther, and while that may be true on a certain musical level, Wig Wam are having fun with the genre, not making fun of it! As much as I like the Steel Panther album, I think Non Stop Rock 'n' Roll is a better bet: it's solid all the way through. From the opening blast of "Do You Wanna Taste It", you know you're in for a heck of a ride. That tune is worth the price of the album alone, but it doesn't stop there. "Wild One" has a great rock riff and a soaring chorus that you can't help but sing along with! "Rocket Through My Heart" is another anthemic rocker that will bring the house down with it's catchy chorus. "Chasing Rainbows" is another great sing-along that utilizes a children's choir to great effect. "From Here" and "Man In The Moon" are the acoustic ballads on the album, but are a bit beefier than the bic-raisers of old. From beginning to end, Non Stop Rock 'n' Roll is just what the title says... and it's one hell of a fun ride! Available from your local independent record store! Please visit www.cimsmusic.com to find the one nearest you!